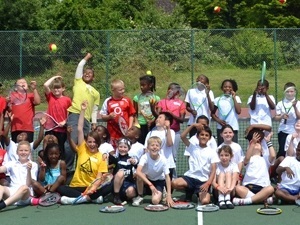 Sydenham Tennis Club provide tennis camps during the school holidays for all children aged 5-15 years old. The camps are the perfect fun-filled holiday activity. Holidays camps are suitable for all standards from children who want to try the sport to those who have regular coaching. We create an encouraging and dynamic environment with the emphasis on teamwork, participation and – most important of all – FUN! We run camps during Easter & Summer holidays, and May & October half-terms. There are half day and full day options. Discounts for club members and siblings – applied at time of booking. Tuesday 28 – Friday 31 May. Book here. The Coaching team will be offering half hour individual sessions during half-term too, from Tuesday to Friday between 4.30-6.30pm. Contact Toby (07545 333535) or Toussaint (07432 862350) directly to book. Remember to provide your child with sunscreen and a cap for protection during hot weather. Supervision is provided at lunchtime for full day camps, but you will need to supply a packed lunch for your child.